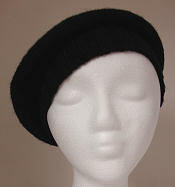 How to Order -- See what customers have said about my knit berets below! This knit beret is a classic in solid colors, and it's loads of fun with different colors. 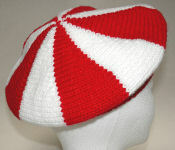 This can be a great choice if you want to use the colors of a flag, or show your school spirit. 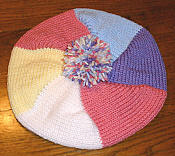 I have also used variegated yarns with great success. 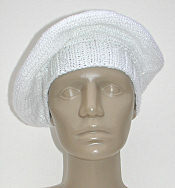 The beret is designed to be warm, but not too heavy. The ribbed brim keeps it in place. The top can be left plain, or embellished with a pompom, button, loop for hanging (my favorite), or the little twig-type piece that adorns traditional French berets. 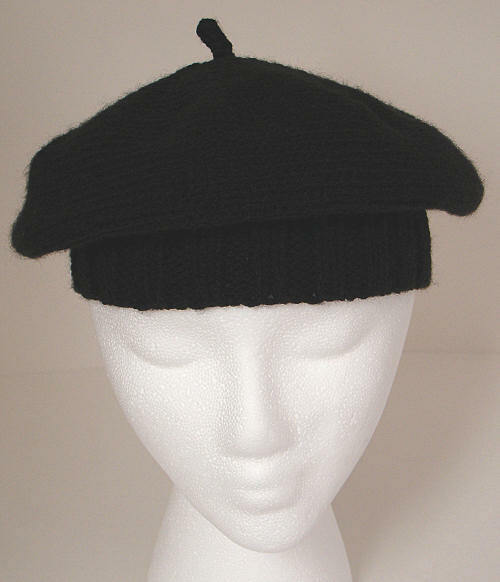 I hand-finish the beret so that it will not unravel, ever. The only seam is on the ribbed band, and I sew that by hand for neatness. 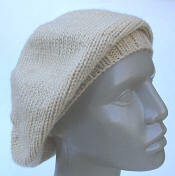 I use my most reliable yarns for this design. 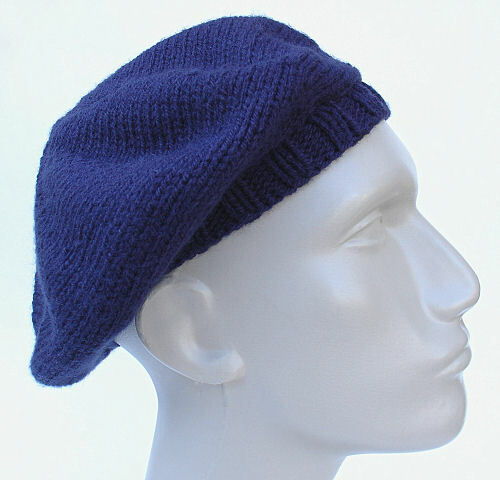 Your beret will see many seasons without any significant sign of wear. 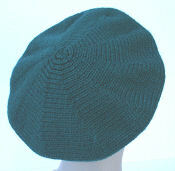 The brim is very stretchy, so two sizes cover almost everyone. The child size will fit babies up to an 8- or 10-year-old. The adult size will fit just about anyone else. The beret style is a perennial favorite because of its ability to make a fashion statement while keeping you warm. 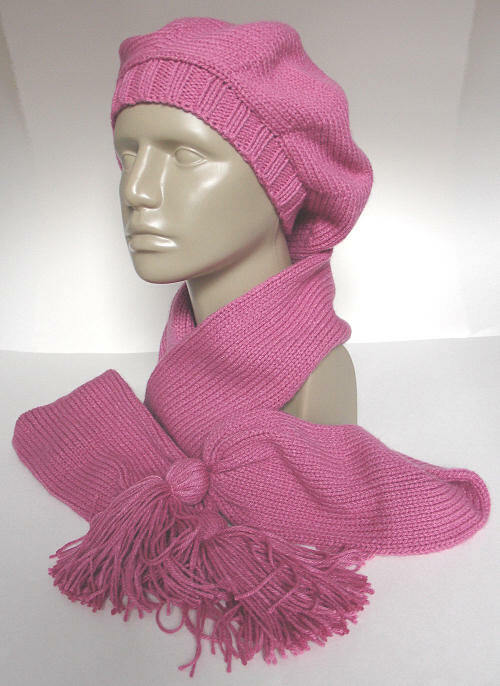 It can be easily worn in fall or spring, since it is not as heavy as many winter hats. Have several, in colors to match all your coats and jackets! Pull it to one side, or to the back, and get a completely different look. 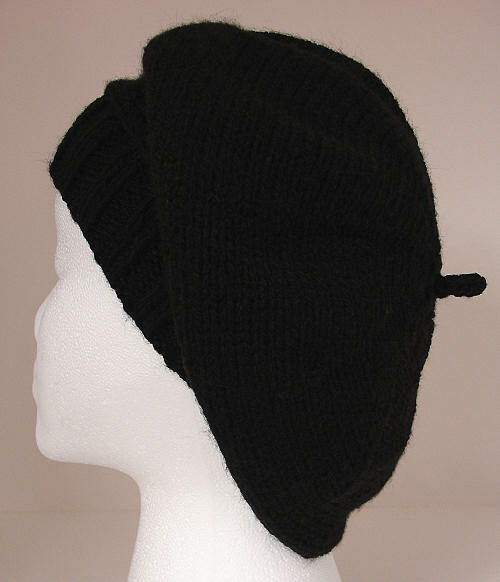 I make the adult size in three different versions: minimalist, moderate, and full. Each has a different style or look; just choose your favorite!